The Western genre is probably the least publicised and produced genre in today's cinema. You just don't hear about them with the same enthusiasm as you'd hear about a superhero epic or a gritty drama. Mainstream Westerns are a rarity now, while some films touch on the genre or incorporate some of the elements into their scripts (The Hateful Eight, The Revenant to name a few) it's tough to locate any wide release in the last few years that resides fully and solely in the Western category. Hell or High Water is probably the closest we've come since Tarantino's Django Unchained back in 2012. This film, directed by David Mackenzie and written by Sicario's Taylor Sheridan, again heavily incorporates other genres besides the Western (notably the drama and heist genres), but with its strong accents, archetypical characters and beige colours, it's the closest we've got this year. It's also absolutely bloody brilliant in just about every way. Toby Howard (Chris Pine) and his ex-convict brother Tanner (Ben Foster) have begun to rob banks, only taking medium amounts of cash and no more than $100 bills in order for their money not to be tracked. When the news of their repeated thieving reaches the authorities, two Texan rangers are assigned to the case, led by Marcus Hamilton (Jeff Bridges), who attempt to prevent them hitting what they believe to be the last bank on their list. It's a nicely simple plot that perfectly fills the film's 102 minute run-time, leaving tonnes of room for humour, character development and thematic ideas that help this story to become fully realised. The biggest strength of Hell or High Water is its script; the intricacy and delicacy with which Sheridan has written this story and these characters is astounding. He never caves in to exposition, he never allows any repeated joke to become stale, he never lets any one scene last too long or not long enough. His pacing is absolutely spot on from the beginning, creating a film that flows efficiently from the first frame to the last without ever feeling like it's unsure of where to go next. Sheridan's almost total abandoning of exposition is a wonderfully refreshing thing. Toby and Tanner's motives are only barely laid out, almost drip feeding information across a number of scenes in the film's first half. Never do the two brothers sit down and engage in a forced conversation detailing their plans for the audience's benefit. Tanner's reason for his jail sentence prior to the film isn't revealed until the penultimate sequence, and even then it's played so subtly that a badly timed cough would make you miss it. This is a film that makes you believe in the art of subtlety, no piece of information feels forced, no back story feels like it's being brought to attention to tick "character development" off the list of things the film needs to achieve. Every word spoken in the film feels organic, and this gives all of the cast the easiest job in the world. Pine and Foster are wonderfully engaging as the two brothers, their relationship is front and centre the whole time, never feeling like any less than the sum of its parts. Bridges is also reliably great, bringing a wealth of experience to the role but never forgetting to have fun with it. The humour all lands too, no matter whose mouth it comes from. It's never laugh-out-loud funny (nor is it trying to be), but it will make you grin from ear to ear every minute of its runtime until the plot hits a moment in which humour would no longer work. When the film reaches this point, Sheridan just stops trying to be funny, to terrific effect. The control he has over the pacing, dialogue and tonal balances across the film is just extraordinary. When Hell or High Water reaches its final act, though, I found myself unsure of one thing: what is this film saying about morality? To be frank, I was initially frustrated with the way the film dealt with morality. Well, not so much the way it deals with this, but rather what the impact of the film's resolution means when looked at with the rest of the film. It's tough to discuss without spoilers, so things will get pretty spoilery for these next two paragraphs, so skip ahead if you want to avoid that. The film does an admirable job of making us like Toby and Tanner and Marcus and even his partner Alberto, but it does this to such an extent that it's tough to find a side to lie on. When the film wraps up, then, with the death of one person from either side, and both sides emerging partially victorious and partially defeated, is it unsatisfying? Initially, I would have said yes. I felt as if the film lead to an action packed finale, but was unsure of how to end without one of the two sides actively losing. There's no winner and, in a way, no ending. The film's final sequence, as beautifully scripted as it is, hints at more to the story that we won't get to see. It feels underwhelming, and it feels unsatisfying. But then, I realised something. The film is incredibly focused on the idea of pairs. We have the two brothers, the two cops, the two sides of the battle, we're even introduced to two waitress characters across the film, and the scene in the gas station proposes the idea of two generations shown through two different cars. The film repeatedly makes use of pairings, and it does this very subtly, never drawing too much attention to it. When looked at through this angle, the film's resolution makes sense. The two sides of this film features pairs of similar types: of Tanner and Toby, Toby is more quiet and subdued while Tanner frequently picks on him in a well intended way, and is easily the more boisterous and confident of the two. You can say exactly the same for the two Rangers, by simply swapping Toby's name for Alberto and replacing Tanner's name with Marcus. It makes sense, then, that the two opposing sides lose alternating roles from their pairs. The final act claims the lives of both Tanner and Alberto, leaving Toby and Marcus to form a new pair of their own with both of them filling the same roles as they did in their previous pairs, just without the heart and good intentions that both pairs had before. This is where the film's impact really lies. Not within the deaths of one member of the pair, but with the formation of a new pair that symbolises all that was destroyed when both Toby and Marcus lost their partner. Hell or High Water is just a brilliant film through and through. It packs all of these thoughtful ideas on what it means to be part of a pair, and binds it to an engaging and perfectly weighted story that still finds time for humour. The first 80 odd minutes are so enjoyable that the film almost feels warming, it simultaneously asks you to think for yourself but never pushes you too hard. While I think Sicario is indeed a superior film (if only because its genre and styling is more akin to my personal taste), it's seriously tough to fault Sheridan's script here. He has crafted an intricate and subtly powerful piece of storytelling, the kind of which we rarely have the privilege of enjoying on the big screen anymore. 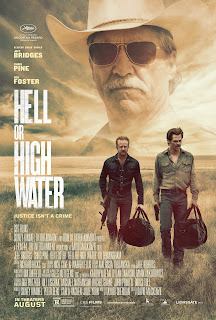 In a year filled with big loud superhero films and intense claustrophobic thrillers, Hell or High Water stands out for making all of the small moments matter, and placing all of its trust in the audience to follow it along its journey. It may not be a Western through and through, but the elements of the Western that it does incorporate are so expertly crafted that I genuinely hope the genre has a real shot of making a comeback. If we got even one more film like this every year then, who knows, maybe contemporary cinema will be all the richer for it. To Summarise: Making the most out of its top notch cast and well balanced humour, Hell or High Water is a deeply enjoyable Western that benefits greatly from Taylor Sheridan's delicate, powerful and subtly intelligent script.